With the look and sound of a '50s PAF Humbucker, the Seymoud Duncan Antiquity Gold Neck Humbucker provides you with the aged and experience pickup feel, handcrafted and boasting true vintage PAF sound. Seymour Duncan aimed to bring the sound and appearance of a Seth E. Lover designed, well-worn, '50s PAF humbucker with his original Antiquity? Humbucker. By providing the aged feel of a pickup that looks and sounds like it's been in use for 40 to 50 years, the pickup brings a sense of played experience. The cover and poles have been aged to emulate this, the gold covers of this particular Antiquity Humbucker are no exception to this design. You'll experience true vintage PAF sound, providing warm, full, bright, and mellow tone, with smooth sustain and relatively low output. If you're a PAF fanatic with vintage-looking guitars, these would make a great addition. These Antiquity Gold Humbuckers are great for brighter-toned instruments, but not recommended for use with ultra-high-gain tube amplifiers over 50 watts. Antiquity Gold Neck Humbuckers are crafted by hand in Seymour Duncan's "Antiquity" room, with each pickup signed on the magnet and bottom plate, so you can be assured of genuine Seymour Duncan Antiquity quality. 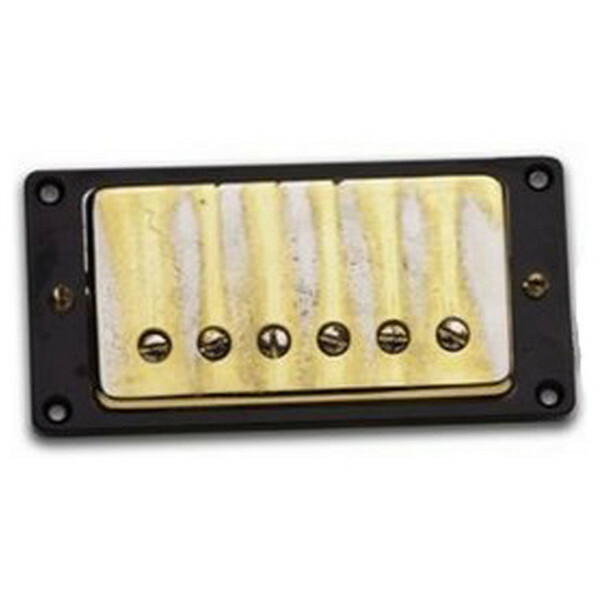 This Antiquity Gold Humbucker comes with a front-tapered mounting ring and the screws that go with it. Because this pickup isn't wax-potted, its vintage sound and appearance are kept.